The tourmaline family consists of at least 14 distinct minerals, but the variety elbaite accounts for nearly all gem-quality tourmaline. It was named as a result of the colored and colorless tourmalines found on the picturesque island of Elba off the western coast of Italy--history buffs know this island as the place where Napoleon Bonaparte was exiled in 1814. Although best known in shades of green and red, elbaite can also be blue, purple, yellow, or colorless. 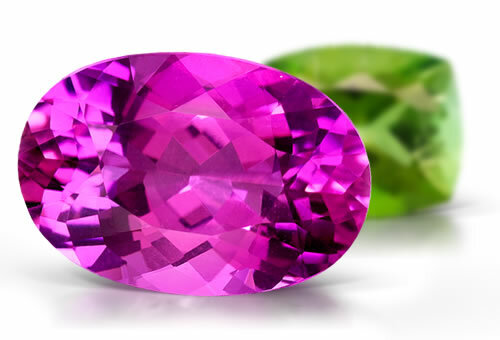 Notable varieties of elbaite include rubellite, green tourmaline, indicolite, watermelon tourmaline, Paraiba tourmaline and colorless. Dark material might have birefringence as high as 0.040Paraba Tourmaline is a Cuprian Elbaite.Rubellite is the red to pink variety. Green elbaite tourmaline stones are type I clarity stones. Blue, purple, orange, yellow and bi-color or parti-colored elbaite tourmalines are type II clarity stones. Stones might contain liquid and gas inclusions that are long and thin, reflective gas-filled fractures and color zoning.